ATLANTA A 14-year-old boy was wounded after being shot in the head outside a middle school Thursday afternoon and a fellow student was in custody as a suspect, authorities said. No other students were hurt. Police swarmed Price Middle School just south of downtown Atlanta after reports of the shooting at 1:50 p.m., while a crowd of anxious parents gathered in the streets, awaiting word on their children. Students were being kept at the locked-down school some two hours after the shooting but television footage showed some of them being dismissed. The wounded boy was taken "alert, conscious and breathing" to Grady Memorial Hospital, said Atlanta police spokesman Carlos Campos. 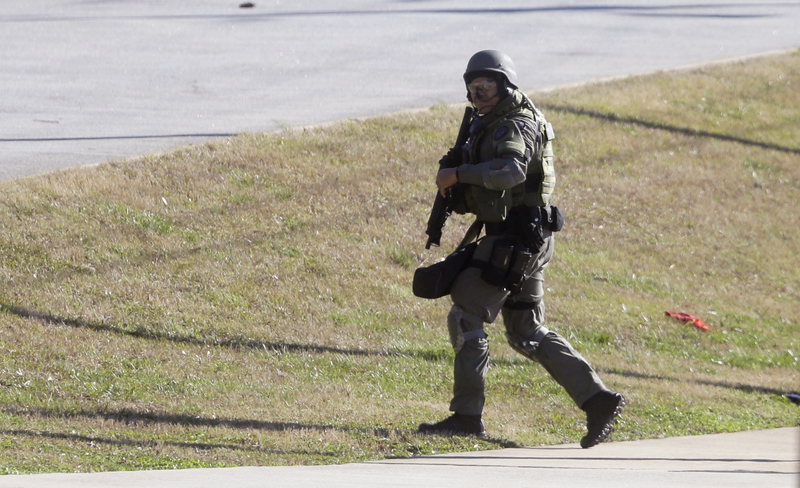 Atlanta Public Schools said on their website that the suspect also was a student at Price. Campos said the injury was not life-threatening and investigators believe something occurred between the two people involved that may have led to Thursday's shooting. Calls to the school district were not immediately returned. Atlanta Fire Cpt. Marian McDaniel said the teen was shot in the back of the head and a teacher was treated at the scene for minor cuts. Shakita Walker, whose daughter is an eighth-grader at the school, said she received a text from her that said "Ma somebody's shooting and somebody got shot." Walker, who works at another school, said she jumped in her car and was thinking "just hurry up and get there." The fear and anxiety was palpable in the crowd, as one person yelled "Does anyone know what happened?" Mayor Kasim Reed condemned gun violence in a statement shortly after the shooting and said counselors were already at the school to meet with students, faculty and family members.